Yelp's top 100 restaurant list: Da Poke Shack is America's top-rated restaurant. Da Poke Shack may not have a Michelin star, but it has ridiculously fresh, raw Ahi tuna salads. If you ask the professionals, the best restaurants in America are fancy-pants establishments like Alinea in Chicago, the French Laundry in Napa Valley, and Le Bernardin in New York, where a meal will set you back hundreds of dollars per person. But if you ask the foodies on the customer-reviews site Yelp.com, you’ll get a very different answer—and, in many ways, a better one. For the first time, Yelp has released its own list of the 100 best places to eat in America, based on reviews from millions of diners who use the site. To arrive at the rankings, Yelp’s data mining engineers looked at both the average star rating for each restaurant and the total number of reviews it received. The resulting list is a delightfully unsnooty antidote to the Michelin Guide. Yelpers are suitably impressed by haute cuisine, and the site’s top 100 does in fact include Alinea (No.7), the French Laundry (No. 34), and Le Bernardin (No. 45). But they care just as much about traits like charm, authenticity, and value for the money—traits that tend to fall by the wayside when the pros draw up their best-of lists. And so those white-tablecloth critical darlings must elbow for room at the table alongside Yelpers’ favorite barbecue joints, taco stands, and pho spots, many of which are beloved as much for their cheap prices and homey service as their delicious fare. On Yelp’s list, New York’s top restaurant is not Jean Georges or Per Se but a vegan food truck called the Cinnamon Snail that earns top marks for its vanilla crème brulee donut and maple mustard tempeh sandwich. Southern California’s best include Tacos El Gordo in Chula Vista, Oscar’s Mexican Seafood in San Diego, and Joe’s Falafel in Studio City, whose prices all rate just one dollar sign on Yelp’s four-dollar-sign scale. Denver’s highest ranking goes not to Frasca, with its James Beard Award-winning wine list, but to Biker Jim’s Gourmet Dogs, where you can nosh on reindeer, elk, or even rattlesnake meat. 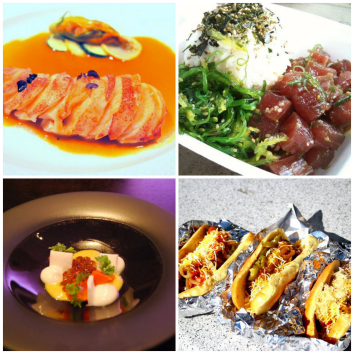 Clockwise from top left: dishes from Le Bernardin (#45), Da Poke Shack (#1), Biker Jim’s Gourmet Dogs (#12), and Alinea (#7). But the top restaurant of all on Yelp’s list is one that probably flies even further below the average food critic’s radar. It’s a tiny seafood haunt wedged into a condominium complex in Kona, on Hawaii’s Big Island. It’s called Da Poke Shack, and in Yelpers’ eyes it’s pretty much perfect: an average of five stars on 612 customer reviews. Aficionados swoon for its poke bowls—salads that combine Japanese-inflected spices and greens like seaweed or kimchi with generous chunks of still-floppingly fresh, raw Ahi tuna. (This picture should give you a pretty good idea of the place’s primary ingredient.) They run about $8 a bowl, depending on market prices, and you can round out your meal with some garlic edamame and a can of Hawaiian beer and be out the door for about $15. A few caveats: Da Poke Shack is “wildly popular,” reviewers note, so if you come at peak lunch hour you should expect to wait in line for a bit. And there’s hardly any seating, so you might be best off grabbing your food to go—one Yelper suggests taking it out to the sea wall and watching the waves crash as you dine. 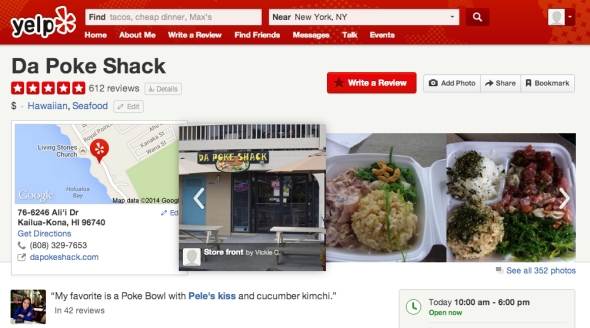 Oh, and don’t go expecting dinner, because it closes at 6 p.m.
Are Yelp’s rankings definitive? Of course not. They’re shaped by the demographics of the site’s users, who skew young, middle-class, and tech-savvy. And while the sample size is large, there’s some selection bias at work. Da Poke Shack, for instance, seems more likely to be visited and reviewed by someone who already knows she loves poke than, say, a steak-lover with an aversion to raw seafood. Yelpers, by and large, tend to evaluate establishments on their own terms, which means that their top picks won’t necessarily appeal to the least common denominator. That said, every restaurant-rating system worth its salt is highly subjective. And I’d argue that, in comparison to its buttoned-down brethren, Yelp’s list makes for a far better reflection of the glorious smorgasbord of cuisines and dining styles that you can find in America today. We live in a golden age of food, from $200 prix fixe feasts to divine $1.75 adobada tacos, and this list proves it. See below for Yelp’s top 20 picks, or click here for the full list.